The ideal contract manufacturer is more than a transactional supplier, but a partner that improves the product and process. When OEMs outsource printed circuit boards or electronic box build assemblies, the primary criteria when selecting a contract manufacturer has always boiled down to cost, quality and delivery. However, with so many companies claiming to deliver these three key elements, it can be difficult to assess if a current or future contract manufacturer is truly reaching what should be a very high bar. Ultimately, differentiating between the available options requires contemplating the question from two points of view: supply chain management and engineering. Although there is commonality between the two, both have unique perspectives in what they require, and expect, from an electronics contract manufacturer. Where they converge, however, is a desire to work with electronics contract manufacturers that function more as true partners than transactional suppliers. By doing so, the OEM benefits from additional design and manufacturing expertise that can serve to improve the product, logistics and even reduce manufacturing costs. Supply chain professionals like Lindner focus on the “triangle” of quality, cost and delivery when considering whether to work with a contract manufacturer. “Any supplier that can provide all three elements is a candidate to be a contract manufacturer for us,” says Lindner. As such, rigorous vetting of each supply chain supplier in terms of its capabilities, quality management systems, and ERP systems is typically required. But a simple customer-supplier relationship often is not sufficient. Because business conditions are constantly evolving and changing, working with a true partner that is continuously looking to improve production techniques and logistics can provide a competitive edge. Lindner chose to work with contract electronics manufacturing company Pennatronics, based in California, PA. The company delivers high-speed surface-mount and through-hole assembled circuit boards and/or subassemblies, and is capable of doing electro-mechanical box-builds, design engineering/board layout, functional test design, and customer repairs management. According to Lindner, the two companies hold bi-weekly meetings to review his production yields, any field test data, customer Requires Authorizations, and any concerns. At Aesynt, a manufacturer of medication and supply handling equipment for healthcare providers and pharmacies, James Norwood, was seeking more in a contract manufacturer than cost, quality and delivery by selecting Pennatronics. As Director, Manufacturing Supply Chain at Aesynt, Norwood sought top notch technical skills and equipment, as well as flexibility. 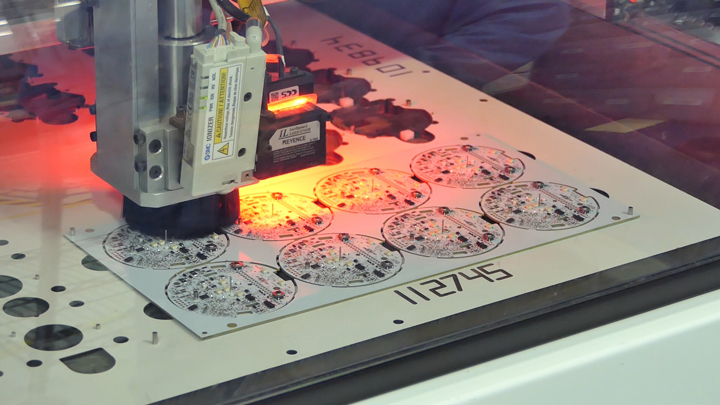 Although Aesynt designs all the printed circuit boards and provides the specifications, the contract manufacturer purchases all the parts, assembles, tests and ships the completed products. According to Norwood, Aesynt turned to Pennatronics in part due to the strong technical background of its employees. The company is also now ISO 13485 medical device-certified, an international standard that sets out requirements for quality management systems specific to the medical device industry. Another vital perspective for any manufacturer considering working with a contract manufacturer is that of engineering. In that regard, quality is often the focus, with cost and delivery still important concerns. To achieve this, the contract manufacturer’s engineering capability must be superior, which often can require various testing procedures to ensure product quality. In addition, for the best results the contractor must also have the ability to collaborate to improve design and manufacturability. As such, choosing the right contract manufacturer will involve an important process of initial evaluation, followed by ongoing evaluation and collaboration over time. Take, for instance, the experience of Bacharach, a global leader in the design, manufacture and service of gas detection, monitoring and analysis instrumentation for the HVAC and refrigeration industries. The OEM deals with a number of specialty gases that are used to calibrate its instruments, as well as a variety of sensors utilized in those assemblies. “We originally used to do all of our printed circuit board assemblies in-house, but it got to be quite expensive maintaining the surface mount equipment and keeping everything up to date for the amount of throughput we had,” says Bacharach engineer Rich Lange. Bacharach chose to outsource about 80 of these printed board assemblies, which ranged from 50 to 10,000 annually in volume, to a reliable electronics contract manufacturer that could meet its rigorous quality and testing standards. According to Lange, Bacharach first vetted any potential contract manufacturers to include only those that were ISO 9001 certified and possessed the correct production and testing equipment, capable of the necessary throughput. “We started by outsourcing one or two printed circuit boards for quotation to get familiar with the various companies and narrowed the field down to a few vendors,” says Lange. Due to the focus on quality, Lange says that part of the criteria to win more business included expertise in a combination of manual testing, automated testing, and functional testing. The functional testing involves evaluating voltage, temperature calibration, and other functional measures of finished product. In this regard, Bacharach was able to closely work with one contract manufacturer to achieve its quality goals and improve both design and production. “By doing the engineering up front, hand in hand with Pennatronics, we reduced the amount of time and cost that it took to produce each product, sometimes very significantly,” says Lange. As an example, he points out that one of the instruments previously required a manual testing procedure that also involved calibration and programming. “After we worked with their engineers to establish an automated test fixture, we reduced our throughput time from about 20 minutes an instrument to about two minutes, which has resulted in very substantial savings,” says Lange. According to Lange, collaboration with the contract manufacturer continues to improve over time. “Previously before outsourcing our printed circuit boards, we held a list of several hundred parts internally,” says Lange. While manufacturers all have their own criteria in deciding which contract manufacturer is best for their application, choosing one that is ready and willing to collaborate can only improve the product and process.